The Obama administration proposed this month that the federal Medicare program make one bundled payment for each joint replacement surgery performed in Indianapolis, Evansville, South Bend and 72 other metro areas. This is the most significant thing that’s happened in health care all year. It’s a bigger deal than Anthem’s trying to buy Cigna. It’s bigger than nurses trying to unionize at Indiana University Health. And this is far, far bigger than the U.S. Supreme Court’s ruling that upheld the Obamacare subsidies. One reason is simple math: Joint replacement procedures are so lucrative for hospitals that any changes to payments in that area will—and have—grabbed the attention of hospitals and doctors. But the second reason is more complex and requires a bit of a history lesson. So, please, bear with me. As I’ve written, ad infinitum, the buying and selling of health care services in America is a complicated mess. If McDonald’s operated like a hospital, when you ordered a Happy Meal with a burger, fries and drink, you would be charged a separate price for the meat, bun, cheese, pickle, mayo and paper wrapper, the fries, carton and ketchup, the cup, ice and soda. And a separate price for using McDonald's building to eat. Then each price would be subject to a different discount negotiated by your nutrition insurance company, rendering all the prices you were quoted meaningless. Not surprisingly, rather than taking your cash at the drive-through window, McDonald’s would have staff members inside each restaurant, beavering away to figure out what you owed. They would take 45 days to figure it out and, only then, mail you a bill. Why do hospitals function this way? The federal program for seniors is the nation’s largest health insurance program, generating about 40 percent of the average hospital’s revenue. But its influence is far broader than that. Since its creation in 1965, the ways Medicare pays doctors and hospitals have become the benchmark followed by most other private insurers and, therefore, the way health care providers—as well as all the makers of drugs, devices and diagnostics that serve health care providers—talk and think about how to make money. Medicare adopted the American Medical Association’s CPT codes for the different medical procedures as its basis for paying physicians in 1983. In that same year, Medicare adopted the system of DRGs (diagnosis-related groups) as its method of paying hospitals for their services. Those payment schemes combined to create one of the most elaborate systems of regulations that has been applied to any industry in the nation, according to Harvard Business School professor Clayton Christensen, and have prevented most cost-saving innovations that have occurred in other parts of the economy. 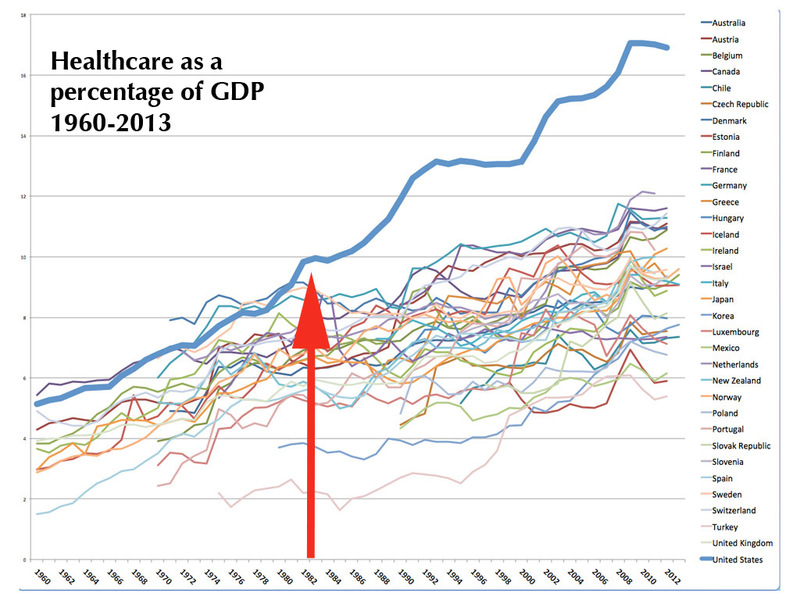 Not surprisingly, then, a recent blog post by health care futurist Joe Flower pinpointed 1983 as the inflection point when U.S. health care spending took off from the trends seen in the rest of the world. But on July 9, the Obama administration proposed something radically different. It plans to MANDATE that hospitals in 75 metro areas—including Indianapolis, South Bend and Evansville—will receive one payment for everything they, their doctors and other health care providers do just before, during and for 90 days after a joint replacement surgery. The revenue of hospitals and, critically, the income of surgeons, would hinge on how well the patient who received the surgery did during that 90-day period afterward AND on whether the cost of the procedure came in above or below a target price set by Medicare. Dr. Michael Meneghini, an orthopedic surgeon at IU Health’s Saxony hospital, said this is the start of a new era in which doctors, hospital administrators and even patients will be able to understand hospital pricing. Last year, Meneghini spearheaded IU Health's efforts to offer bundled pricing on joint replacement surgeries, but then the hospital system took a wait-and-see approach. Now Medicare’s proposal, assuming it is not significantly revised after public comments are received, will require bundled pricing. In the future, Meneghini expects, Medicare will apply bundled pricing to other kinds of surgery. “It’s just the beginning,” he said. Meneghini still has some questions and concerns about the Medicare proposal. He said patients with complicating health factors—diabetes, obesity, smoking, heart disease—cost more to treat. Medicare currently pays about twice as much for joint replacement surgeries with complications than for those without. But that doesn’t capture all the range of complications or their cost, Meneghini said. “Hopefully, our outcomes measures will improve in sophistication,” he said. If not, he warned that orthopedic surgeons and their hospitals might turn away high-risk patients so they don’t hurt the providers' quality scores and require refund payments to Medicare. But if those kinds of details can be worked out, Meneghini thinks bundled payments will make health care pricing clearer and restore the incentive for health care providers to do what other industries have made routine: keeping costs low and quality high.